Councillor Ken Gowans is unaware of any problems with the "fabric" of the school. 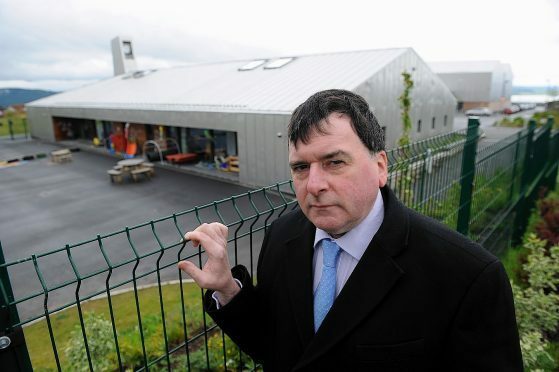 A school inspection report into one of Inverness’s fastest-growing primaries took the unusual step of referring to the building children are taught in. Milton of Leys Primary on the south side of the city is widely seen as being at bursting point due to growing demand and the number of classes has doubled since it opened. This week, the school received a positive report from the schools inspector. The document also raised some concern after mentioning the fabric of the building and explaining the background of the school in terms of numbers. It also explains that, due to the demands on school accommodation, there are plans for additional temporary accommodation which would encompass the nursery classes, with the current nursery accommodation being utilised by the school. Last night, it was not clear what the exact nature of the matters raised by the inspector were. Local Highland councillor Ken Gowans, who wants urgent action to address the overcrowding issue, said: “I have no information that would suggest anything other than it being a good quality building,” he said. The £7million school opened in August 2011 and hailed as one of the council’s flagship facilities. Its purpose, in part, was to ease space constraints at Inshes Primary, which opened four years earlier. But by 2013, 42 P6 pupils were being taught in a single class in the school library due to lack of space. Pressure on the school roll has intensified with council approval for hundreds more homes in the area. Its initial eight primary classes have doubled to 16, comprising 377 pupils along with a flexible provision nursery of 104 children.